The saree is not composite attire and needs refurbishing from the accompanying garment which can play a truly vital role in giving those magical nine yards something more than usual. Every saree creates some kind of imagery-the colors, patterns, weaves and designs can invoke a certain look that is predictable, but this is when the blouse comes in and gives it an edge. 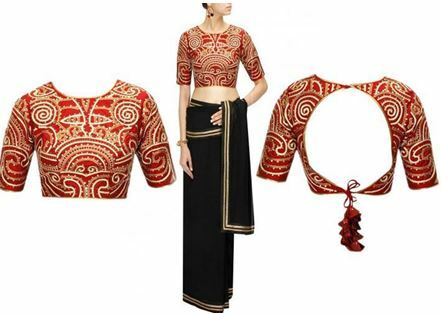 Whatever it might be a well designed blouse with a neckline that suits the saree and more so the wearer, has great deal to do with the overall look that one would be trying to portray, and it is not without a good reason that today blouse designs are one of the top trending searches on the internet and tailors and designers are agog with newer and better designs for one to try out. So what are the fundamental thumb rules that should help you decide what blouse suits what kind of saree-or is it that any saree can fit in with any design of blouse. Quite simply-a kanjeevaram will look ridiculous with a crystal embellished blouse as much as a tussar with a net blouse. So while it’s the material usage that matters foremost in deciding on the type of blouse, the other factors are the cut and design. Blouse necks are central to the decoding of what would suit your body type and when trends catch on, it’s imperative that you not follow it blindly-always summarily weigh your body type and suitability according to event and occasion before you choose the blouse neck. And the thumb rule that one should follow, the ones one cannot afford to forget, is the age factor-while some lissome beauty can afford to wear some styles, a heavy backed lady would be prudent to choose those patterns that flatter her other features and draw attention away from the anomalies. So here are some of the most ‘’droolworthy’ designs that have been getting all the attention not just from stylistas, but also from designers, who have showcased these with some classic sarees this autumn season. The material used for the blouse and how well that goes with your personality. It’s in the judicious choice of what would suit all of these factors that will create the right kind of impact. My first pick is this very simple boat necked blouse that is worn with an off shoulder pallu style saree. Note the crop top effect, the slimness of the arms and neck that creates this imagery and the fact that the waist is undefined. Be sure to try this if you have a slim waist and arms that you could flaunt. The fabric used for this could be thick jacquards also or even heavy silk fabric and crinkled chiffon. A perfect foil to hide the typical bustier styled blouse- this blouse has a gorgeous layer over the lower layer. The sleeveless top has heavy embellishment and can be worn with sarees that come with heavy to little embroidery. Most suitable for lighter fabrics as the design of the blouse will be visible only when the saree is slightly shimmery, light and diaphanous, rather than a heavy textured thicker silk. Would suit most body types as the layering effect does give one slimmer look, but then do be cautious as the almost halter neck is suitable for those with slim shoulders and arms. Another variant in the boat necked blouse is the one that comes with a net back. In this case one can see that the back has been constructed from a sheer fabric and that also has some tie up detailing that further adds a look of fragility and feminity to the look. Chiffon and plain sarees will do maximum justice to this design as the sheer fabric will blend in well with it. The tie up can be in the same colour or a contrasting colour, though a thicker band at the base adds more definition to the structure. In times when more and more women are becoming body conscious and thus getting fitter , the emphasis to show off ones trim back and arms too is in the offing- and this racer back blouse structured with the help of some great quality silk can make you look wonderfully smart and chic. 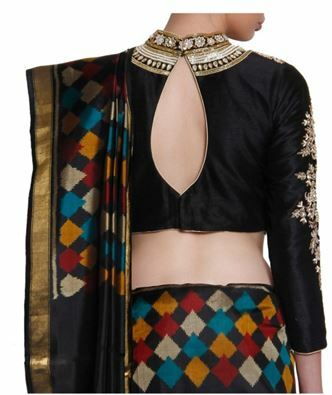 The usage of bold patterned fabric like phulkari or Kutch embroidery fabric could be used to structure this kind of back. It may be zippered at the back as it gives better finish and fitting. In this case the colour red in silk is offsetting the brilliant usage of embroidery which is really very fine. The simple front and high back allows enough space for the entire yoke and the neck portion to bring alive the pattern in the handwork. The sleeves too are structured with the embroidered fabric. It is best suited for those with a slim upper body as anything that is close to the neck and with embroidery makes one look quite plump. The usage of zardozi has been muted with a design very delicate that would be suited to most. The curved back and the winged cap sleeves add a look so very delicate. 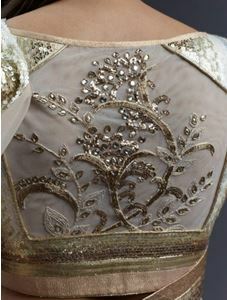 The shape to the back makes the heavy embroidery look all the more fragile and delicate. Perfect for those who are wanting to wear something heavy but not wanting to look and feel too old. Great design for very special occasions. This blouse pattern simply makes the back look all the more slimmer- especially suited for those who have a short height. The back has the ability to make the upper body seem slimmer. Will be high necked from the front while the back can display this design. Would be most suitable for all kinds of occasions, and will be ideal if made with slightly thicker fabric to bring out the beauty of the cut and design. 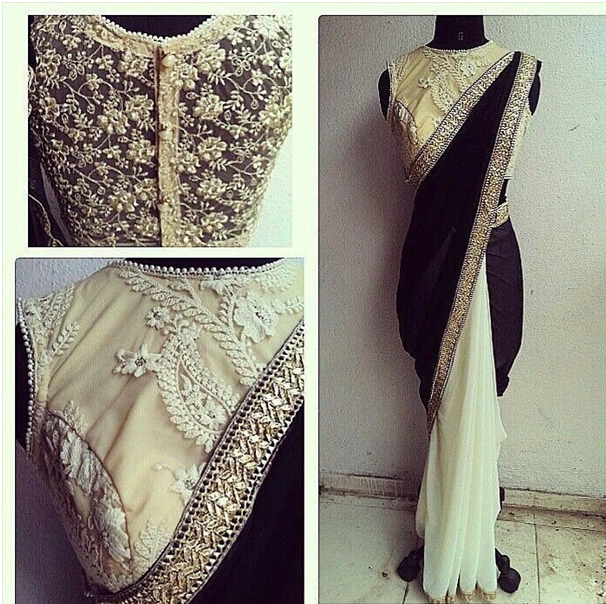 Here is another version of the same design that can be tried with a more traditional saree. The shape of the cutwork is the same–a straight triangle. The fundamental beauty of this blouse lies in the manner in which the tassels creates the look of feminity and when placed at the base of the blouse , the look is alluring to say the least. 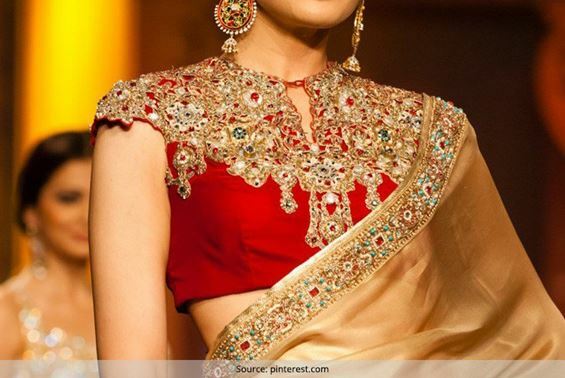 Golden or pearl tassels always makes a brocade blouse look its best as adds more richness to the saree as well. 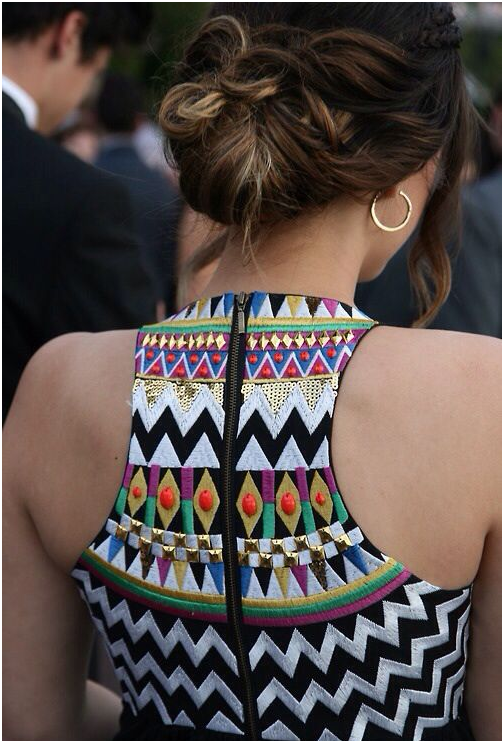 Keep the neck in front high to make the daring back seem more demure overall. Simple and exclusive in its look and perfect for those sarees that come with embroidered borders.The focus should not shift from the beauty of the back and thus its design should in some manner coordinate with the saree and its style of embroidery. Will by and large suit all body sizes and shapes. Suited for all body types, the keyhole design at the back makes the waist seem trimmer and the height too gets enhanced because of the shape at the back. Would look great on velvet and thick silks. This blouse design combines net and silk or taffeta with perfection using the sheer material to completely to cover the back. The front is layered with silk and net with embroidery which gives it a dual textured look with the back and the front having two completely different looks. The structured look in the front gives a wonderful fitting and the buttons at the back make the sheer fabric gain some amount of form and design . The neck and the sleeves have been trimmed with delicate pearl piping. Behind every great looking saree is the blouse that one chooses to wear with them, and with this great range chosen for you, there is very little possibility that you could go wrong!